Well the Halloween Hama beading may be over for another year, but the Hama love is not waning! CraftMerrily recently sent us a couple of Hama Bead gift boxes to review and the first of these has proved to be such a favourite with Little Miss C that I have to admit that we’re yet to properly tackle the second one. 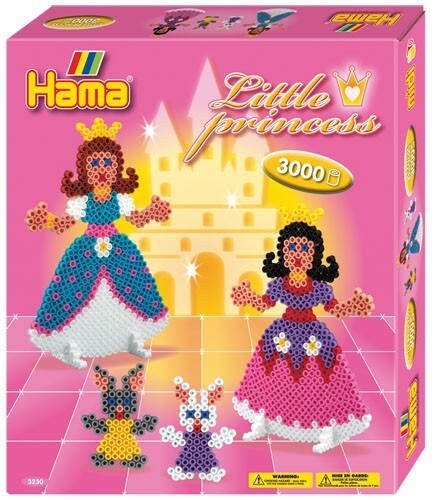 The Little Princess Hama Bead gift box comes with one princess shaped peg board, 3000 beads, and instruction sheet and a piece of the required ironing paper that you use when fixing your designs. 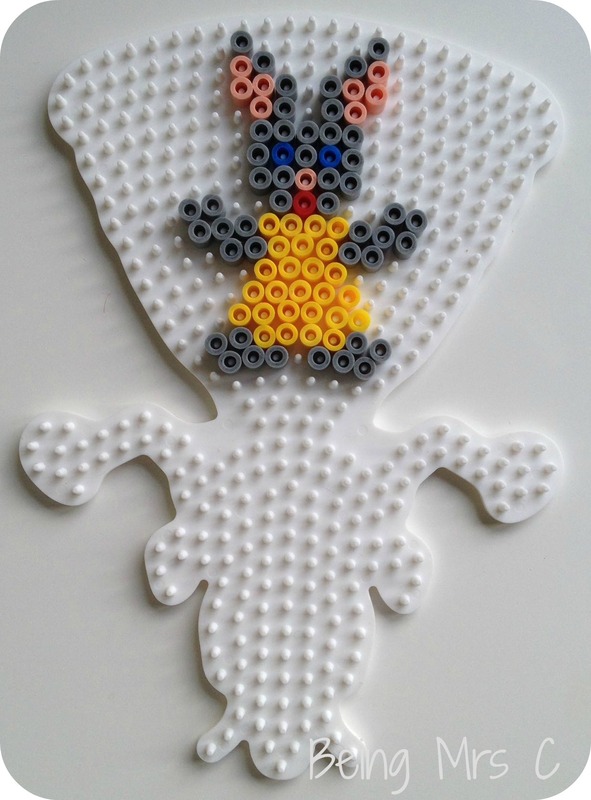 Being a typical four year old girl (and one that happens to be a huge Frozen fan right now) Little Miss C loved princesses and was thrilled to have a go at making her own one from Hama beads. 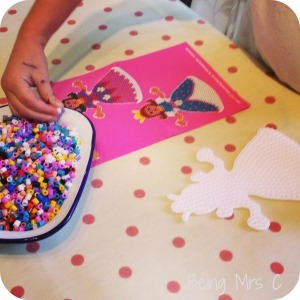 Now normally when she plays with Hama beads she makes up her own patterns if she can’t have a clear peg board with the pattern laid under it. At only four I think that’s what you might have expected at her age, so this was the first time that she’s tried following a pattern herself and it certainly called for a lot of practice of all the counting that she’s been mastering at school. In the end I helped a bit by putting in some of the beads that marked the boundaries between colour changes, but it was really good practice for her to try to get the top of the white pattern at the bottom of the princess’ dress on her own and I was delighted to see that after a bit of frustration she did indeed manage to get it right. 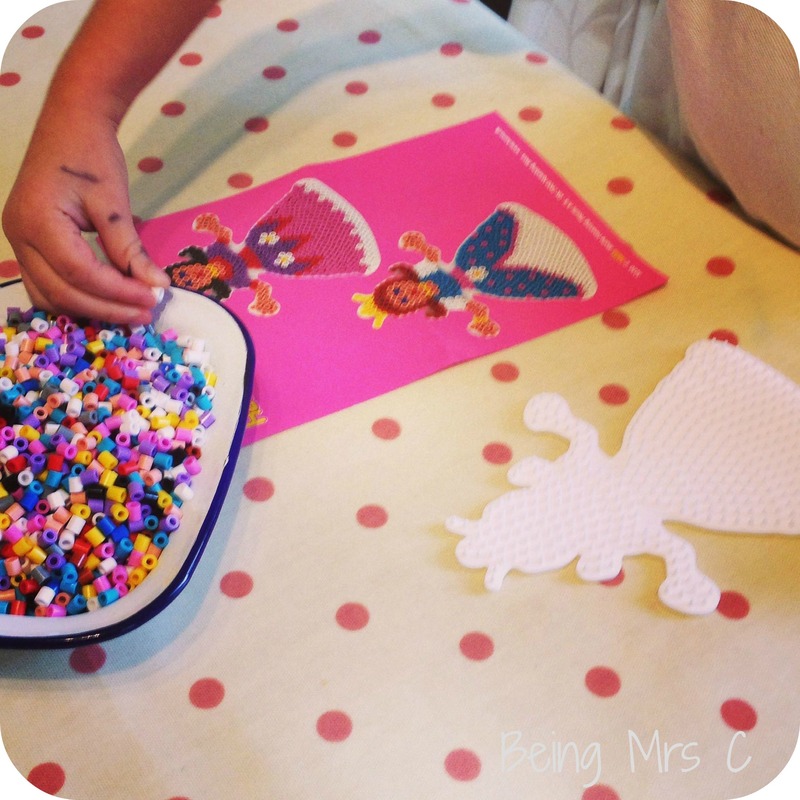 Hama beads really are brilliant at this age, not only as a craft activity that helps children to master fine motor skills, but they also help with counting, colour and shape recognition and patience. 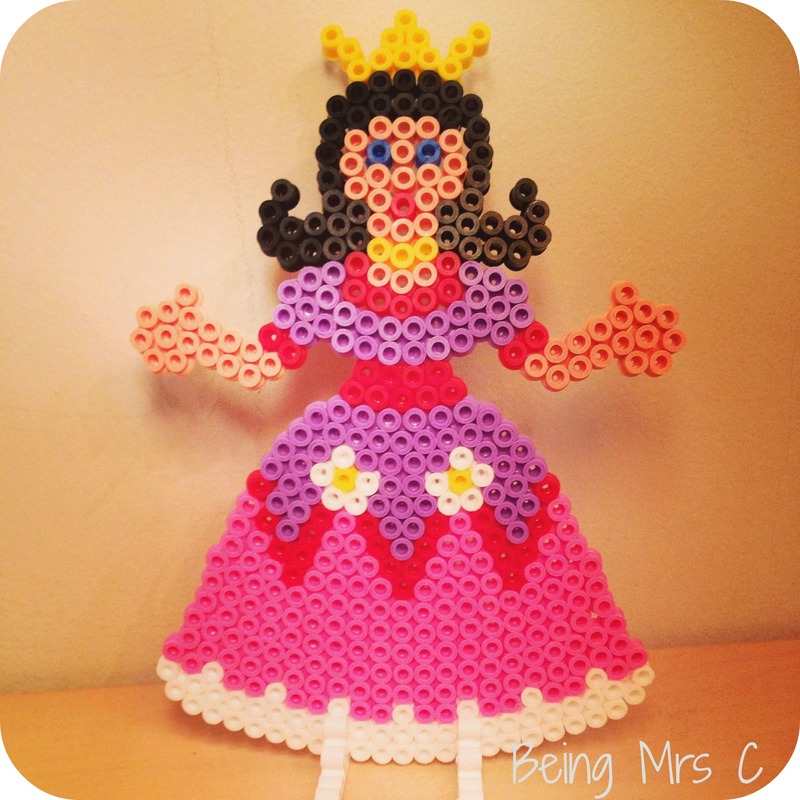 This first princess is now proudly on display in her bedroom along with the second one that I made for her – LMC thought getting the spots in the right place on her skirt would be too tricky for her, and to be honest I had a few attempts too! One genius thing about this particular set is that they’ve also come up with a second design that uses the same peg board, but this time to create a rabbit. Had I not seen this design I have to admit that the idea of turning the board upside down would never have occurred to me! 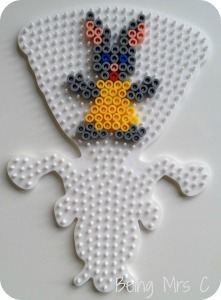 Now we’ve followed the princess patterns included in the kit, and made a couple of rabbits too, I’m delighted that there are actually loads and loads of Hama beads left over to be abel to make so many more. 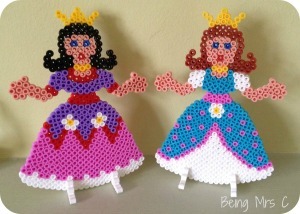 LMC is determined that I need to make one that looks like Elsa so I guess that will be my next challenge. 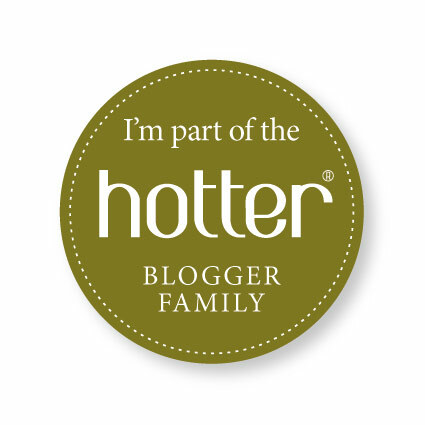 I also recently bought (from CraftMerrily of course!) one of the Hama Inspiration books and this one features a few patterns that use this princess board so I’ll be having a go at those too. When you consider all the time that we’ve spent making these sets so far, the educational benefits of doing so, plus the fact that LMC now has princess decorations in her bedroom as a result it makes this kit seem an absolute steal at just £8.95. Certainly perfect for any little princess loving crafter this Christmas. Disclaimer: We were sent the Little Princess Hama Bead Gift Box to review by CraftMerrily. 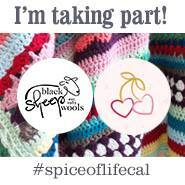 I bought the Inspirations 11 book from them separately and buy all my Hama bead supplies from CraftMerrily. All opinions are my own.